You Wanted FIT… You Got It!! If you’ve every been in the Playhouse on a Wednesday evening, a Friday evening, or a Saturday morning, you’ve probably had an encounter with the amazing GiGiFIT Teens class. These participants have strictly made it part of their weekly routine to be in this class and they won’t miss it for anything! The GiGiFIT curriculum is effective, challenging, and SO MUCH FUN! All the exercises have been created especially for individuals with Down syndrome and they focus on things like balance, stability, movement control, and endurance. Plus there are always some fun dance routines incorporated into the sessions to get the blood pumping and the spirits high! We are aiming to take this same energy and excitement into our newest addition to the program at Hoffman Estates, GiGiFIT Adults. Our community of adults with Down syndrome is vast and they will always amaze you with their strong and wonderful personalities. We want to offer the same opportunities for fitness, confidence, and connections for everyone! GiGi FIT Adults is completely free and takes place every Wednesday at 6:30 pm and every Saturday at 12 pm… Come out and join us! Sabrina is waiting for YOU to be a part of this growing team! We’re looking at YOU, Fantastic Friends participants! Let’s do this!! GiGiFIT empowers individuals with Down syndrome to be more independent and confident in their abilities while improving overall health and wellness. 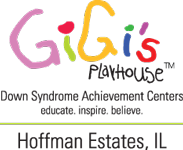 To find out more, visit our website at https://gigisplayhouse.org/hoffmanestates/gigifit or visit our Playhouse anytime!